Mountainview Inn is set in the Free State near Harrismith in the tranquil surroundings of the Bergview Complex on the N3, overlooking the magnificent Patberg Mountain. This makes it the ideal stopover and the combination of old fashioned values, cleanliness, courtesy, beauty and modern technology ensure an enjoyable stay. There are 45 en-suite rooms, all equipped with tea and coffee facilities, air-conditioners/heaters, and TVs with 12 channels. Each room has undercover parking. 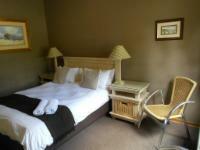 Our double rooms are equipped with two double beds each, accommodating a maximum of four people. 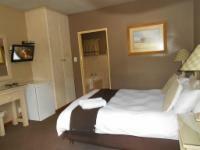 The single rooms are equipped with one double bed each, accommodating two people each. The Caravan Park has 30 stands with power points, 30 tent stands and state-of-the-art ablutions, all surrounded by an electric fence. Guests have a choice of of breakfast, either at Wimpy or the adjacent coffee shop, Heikes Place or Teak Table. There is a petrol station, an ATM, conference facilities, food outlets and shops, an a la carte restaurant, and an animal and play park on site. There is also a doctor and pharmacy less than 1 km away. A wide range of sporting facilities are also available in and around Harrismith and places of interest such as Sterfontein Dam, the Basotho Cultural Village, Retief’s Monument, and Golden Gate is easily accessible from here. Double or Twin Room Sleeps 4 Includes: Room Only Rooms / Units: 8 Coffee & Tea, Fridge, DSTV (Hotel Bouquet), Air-con, En-suite bathroom with shower & bath. Budget Sleeps 2 Includes: Room Only Rooms / Units: 4 Coffee & Tea, Fridge, DSTV (Hotel Bouquet), Air-con, En-suite bathroom with shower, Desk. My 4 th stay at Mountain View Inn. 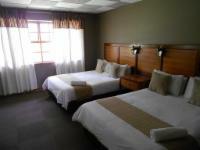 The rooms are very clean and have everything you need for an overnight stay. We only stayed overnight on our way back from Durban. Our initial impression of the room was... it is dated, but the bed was very comfortable and everything was clean. There was even a refrigerator and tea and coffee. The only negative is that we are not given any contact details for a person who can help in case of problems. Our aircon wouldn't switch off . Accommodation and facilities excellent , enjoyed the weekend and will stay there again. Mountainview Inn is 2.2km from the centre of Harrismith , the nearest airport 218.5km (Moshoeshoe I International Airport).